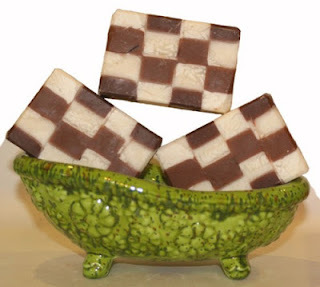 If you love chocolate as much as I do, you will love this checkerboard squares artisan soap. Creamy white vanilla and rich chocolate combine in this handmade artisan soap for a truly luxurious bathing experience. My soaps are made by hand with natural ingredients like olive, coconut, mango, shea, or cocoa butter, castor oil and natural beeswax. This batch also has the addition of pure vanilla and real chocolate. This soap batch has been cured for over six weeks. This makes the soap milder and the water used during the process evaporates. This is done so the soap will last longer in your bath or a shower. If you keep chocolate vanilla hand crafted soap out of direct water spray, let it dry between uses and use a draining soap dish, this will give your handmade soap a longer lasting life. It smells so good, you might want to eat it, but please don't! Buy this gentle, mild handmade artisan soap in my Ginger's Garden store. If you buy more then one, I will save you on shipping. These soap bars will make a great gift for anyone that loves chocolate!